« How will Santi-Özil develop this season? Arsène celebrates his 64th. birthday on 22nd October 2013 and I’d like to offer my personal thanks to Arsène for the great work he has done for the club of my life. I wish him Bon anniversaire, and good wishes from myself and every single person involved with Untold. So by way of a little celebration I offer you 10 Arsène questions to think about. They are not in any particular order. They are about Arsène before he came to Arsenal. There are no prizes for the answers, and indeed all of the answers plus a few personal commentaries are given at the end of the questions. 1) Glen Hoddle and Mark Hately were both bought by Arsène when manager of Monaco. What year was Glen transferred to Monaco? 2) What silverware did Mark Hately win while playing for Arsène? 3) What was Arsène’s first coaching job? 4) Arsène is often accused of being stubborn, but he took advice and travelled a round trip of 6000 miles to watch one particular player. Who was that player? 5) What surprise awaited Arsène at the presentation of the world player of the year award in 1995? 6) Which was the club that Arsène first managed? 7) David Dean has told the story of how he asked a French manager about Arsène and this manager highly recommended Arsène to him. David says that later he discovered that the manager was a friend of Arsène! Who was that manager? By way of a clue. This manager and Arsène were later to meet in England. 8) At the moment we have four German players in the squad. Which famous German player did Arsène sign for Monaco? I’ll give you a clue on this one. This player has two facts in common with Glen Hoddle. 9) Which club came in for Arsène and were refused by Arsène because he was under contract to Monaco? 10) Who did Arsène take with him to Grampus 8 as his right hand man? Bonus question. Who holds the title “World Coach of the Decade”? 1. Glen Hoddle and Tony Hately were both bought by Arsène when manager of Monaco. What year was Glen transferred to Monaco? Commentary: Who would have thought it? The 2nd Saturday in May, cup final day. I was one week married and on honeymoon. It was a glorious sunny afternoon in a small town in Crete. To my wife’s horror I was on a mission. to find a bar showing ‘the match’. ‘Its not Arsenal,’ she kept saying to me! It was Coventry v ‘them or the mob’ publicly known as ototenham. With about half an hour to go I found the dream footie bar. Full of smokey locals eyes fixed on the black and white TV set high on the wall. As we ‘white faced tourists’ entered so we disturbed their concentration. ‘Coventry’ I called throwing my head and hands in the direction of the TV. Moments later I was in the thick of the smoke. forgetting I don’t smoke and the honeymoon wife! Whoops! I was so happy to see Glen Hoddle receive his losers’ medal! At the time never gave it thought that. that Cup Final would be Glenn’s last match for his beloved spuds and his next match would be for a French man in Monaco by name of Arsene. Fast wind to 17 May 2006 UEFA Champions League Final yet another former spuds player is playing for Arsene and this time for Arsenal. He to receives a loser’s medal and for him it was his last match. Spuds two greatest players since the sixties both chose to play for Arsène Who. Answer: French Ligue 1 1987 – 88. Mark was playing for A C Milan when Arsène came a calling. Answer: RC Strasburg youth team. Having got his degree in Economics and with his playing career coming to an end at Strasburg. ‘In 1981, he obtained a manager’s diploma and was appointed the coach of RC Strasburg’s youth team.’ From wilki. 4) Arsène is often accused of being stubborn but he took advice and travelled a round trip of 6000 miles to watch a player. Who was that player? Answer George Weah who was then playing for a local club in Liberia. In 1988 playing for Arsène he won the African player of the year award. It was the first of many awards. 5) What surprise awaited Arsene at the presentation of the world player of the year award in 1995 ? When George Weah received his World Player of the Year award on the platform he called Arsène to the platform and publicly gave him his medal to Arsènein appreciation for all that Arsène had done for him. 6) Which club did Arsène first manage? While assistant manager at Cean in West France Aldo Platini (father of Michel Platini our present President of Uefa) recommended Arsène to Nancy who were then a first division club so it was back to East France. Things didn’t turn out to well there. Hence the economic saying: ‘You can’t splash the cash if there ain’t no cash to splash!’. 7) David Dean tells how he asked a French manager about Arsène and this manager highly recommended Arsèneto him. Dein says that later he discovered that the manager was a friend of Arsène. Who was that manager? Clue. This manager and Arsène were later to meet in England. The Arsène friend who recommended Arsène to David Dean was Gérard Houllier. I could have said clue. ‘They were to meet in Wales,’ but I think that would have been too easy. Incidentally (I didn’t know this) but Gérard Houllier is from the Calais area of France just up the road from Cean where Arsenal was assistant manager – so that could have been the start of their friendship – although that’s just a guess. 8) At the moment we have four German players in the squad. Which famous German player did Arsène sign for Monaco? Clue . This player has two facts in common with Glen Hoddle. In 1992 Jürgen was playing for Inter Milan at the peak of his career then Arsène came a calling. So it was off to Monaco to play for Arsène. What is it about Arsène that attracts international stars to play for him? Arsène was to sell him to Alan Sugar for £2 million. 9) Which club came in for Arsène and were refused by Monaco and Arsène declined because he said he would honour his contract with Monaco? This was before the start of the 1994 season. Monaco having refused to let Arsène go and Arsène still had a year on his contract and said that he wished to honour it. Monaco changed their minds when the team got off to a bad start. Too late for Bayern Munich. Arsène jumped from out off the fire into ‘Japan’. 10) Who did Arsène take with him to Grampus 8 as his right hand man? Answer Boro Primorac. Happy birthday Arsène, from everyone at Untold. And thank you for everything. And a happy birthday from me! There are people about which words are pale to describe what they have done for the good of others. Arsene is one of these people. Happy Birthday Mr. Wenger, and to many more ahead! Happy birthday! Hope you get a nice present tonight…and share it with us all…! Just one question from me. As with workplace birthday tradition in the UK, does Arsene have to take cake for everyone at the game? Happy Birthday arsene and hopefully many happy returns for all of us. HAPPY BIRTHDAY , ARSENE ! @ Charles Veritie – nice one , thanks ! After watching the above clip , noticed that both the opposing goalkeepers had previously played for Liverpool . Q 8 – 2 facts ? Both Hoddle and Klinsmann went on to become club managers and also managed their respective countries ? Let’s add to his presents and help us win Dortmund tonight. Happy Birthday Mr Wenger from me and the Wife. Since you arrived you have had us in the palm of your hand. You have transformed, with a little help from your friends, our already magnificent Club into an institution to be admired the world over. You lead the way on player aquisition with your world wide web of scouts. You lead the way on modern player management including there nutrition and training. You lead the way in the turning of our pitches from mud baths and sand pits into putting greens for football. You are an interlectual, but more than that a visionary, who has lead the way and dragged English football (or at least most of it), kicking and screaming into the 21st Century. But above all, that the thing we admire the most is that you obviously love the Club as much as we do. You, like us, are more than anything a FAN of Arsenal. And a very very passionate one at that ! And for that, and for all the wonderful footballing moments I will treasure for the rest of my life, we salute you and thank you. May there me much much more to come. Ps………Sign the F***ing contract……….Please !!!! You are a good loyal man above all else. Respect. Happy birthday Monsieur Arsene Wenger. I have learnt a lot from you< in more ways than one. God bless you real good. Nice facts. thanks. lets hope we win today, it will be a perfect gift. Happy Birthday and many of them! Firstly I originally had 12 questions but the piece was too long so I cut two out. I saw an interview with Glen Hoddle in which he said that when he was at Monaco it was Arsene who encouraged him to take up coaching. I don’t know how Jürgen came to take up coaching. As I was writing about Arsene I stayed with reference to the two fact I know about Glen and Jürgen that link to Arsene. As to Coventry, I still see the locals in the bar looking at me at the end of the match to see my reaction to the result. Seeing my happiness they must have thought I was a Coventry supporter and if truth be told for that afternoon I was. Happy B’day…enlightened one…only that your enlightenment is mistaken for stubbornness by some but not by the Untold community…ever! Thanks for all those moments that are forever engraved on our hearts…you are the greatest manager to have ever managed a football club…A Genius…A Legend…A King amongst paupers…! @Charles Veritie – Thank you Sir for this wonderful write up! yes sign the thing, I mean..Happy birthday Mr Wenger. 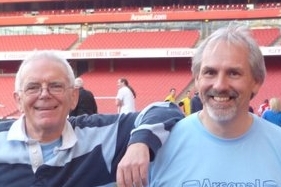 How about a birthday song for Mr Wenger at the Ems during the game….. When I saw the comment from Dankie Daniel in the moderation section my initial thought was: what kind of spam is this, never seen such a thing before and I almost trashed it. but then I had another look and opened it in full and saw the text coming up in a proper way. Maybe he has some Lasagne for Dortmund? Happy Birthday Mr. Wenger, please forgive us not so patient fans who once a while do not share your vision in the face of poor results and exodus of talents from our club.Now as a token of forgiveness you just have to sign a new contract and put an end finally, to the unending PSG rumours. You are a great human being and one of my role models. You are the best of your generation. May your life be happy, healthy and long. And yes, he should be a role model to a generation. Tragically for the current generation they are steered in the direction of the Rooneys, Lampards and Terrys of this World. This Country is just too introspective to ever, ever, in a million years hold a ‘Frenchman’ up as an example to it’s youth. We try to project ourselves as a multi Cultural country embrassing the World. Where as in truth we are still a bunch of drunken pagan thugs who think the World should quake in there boots at the mear mension of our name. The rest of the World apprecite Wenger. It’s only this Country that fails to appreciate whats under it’s very nose. Bon anniversaire Arsene et j’espere que vous pourriez rester avec L’Arsenal pour un autre dizaine d’annees. Happy birthday Arsene and I hope that you will remain with The Arsenal for another decade. Happy birthday Arsene, a giant of a football manager. @Walter, yes, that was quite the construction. I’m not quite sure how he managed to do that. Must depend on the font chosen somehow. Boo2me/Jambug/BrickyG (and others) great posts. Charles Veritie, thanks for a lovely article. My eyes watered as I remembered reading about Weah giving his medal to Arsene.